Doha, QATAR – Qatar Airways is preparing to take part in the Middle East’s pinnacle travel trade fair – Arabian Travel Market (ATM) – being held next week from May 2 – 5, featuring hundreds of exhibitors from across the global travel, tourism and hospitality industries. The Doha-based carrier will have a dedicated stand showcasing the carrier’s award-winning Five Star service and hospitality, including a display of its long-haul Boeing 777 Business Class seats and the airline’s interactive in-flight entertainment system. The stand will also feature on display a large-scale model of the New Doha International Airport. The new airport is slated to open in 2012 with an initial handling capacity of 24 million passengers annually. 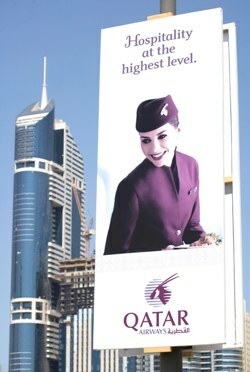 On the opening day of the four-day exhibition, Qatar Airways Chief Executive Officer Akbar Al Baker will host a press conference highlighting the airline’s expansion plans and announce forthcoming developments. The carrier began the year with a successful expansion drive, so far launching five new routes from its Doha hub – Bucharest, Budapest, Brussels, Stuttgart and Aleppo in Syria. The launch of services to the northern Syrian city marked a formidable achievement for the airline, taking its global route map to 100 destinations in a short span of just 14 years. Forging ahead with further expansion in the second half of this year, the airline is set to launch a further six new routes, three of which will be introduced next month – Shiraz, Venice and Montreal, the airline’s first route in Canada. The remaining three routes will be launched in phases from July – Kolkata (formerly known as Calcutta) from July 27, the Bulgarian capital Sofia from September 14 and Norway’s capital city of Oslo, effective October 5.